Dan Burke and Melissa Elson answer questions about helping those suffering, prayer, and God’s will on this episode of Divine Intimacy Radio. Beware of making changes to your spiritual commitments when you are experiencing spiritual desolation. Listen as Dan and Melissa explain why! How does spiritual consolation help us in discernment? Find out when Dan Burke and Melissa Elson discuss rule 3 of Saint Ignatius’ Discernment of Spirit on Divine Intimacy Radio. This week, Dan and Melissa discuss the first Rule of the Discernment of Spirits by Saint Ignatius of Loyola. How can we become more aware of our sins? How does disposition help us to meditate more effectively? Dan and Melissa answer these questions as they reflect on the book “Finding God Through Meditation” by St Peter of Alcántara. How encountering God in prayer and deepening your prayer life can impact your life every day. Why the desire to have a relationship with God important? Dan and Melissa discuss their own encounters with God in prayer and Scripture. Does God send storms and sufferings to try us? 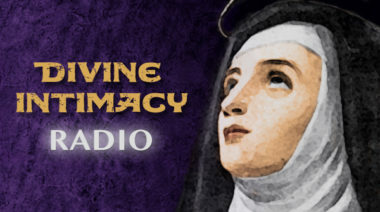 Find out when Dan Burke and Melissa Elson discuss the second part of the day 30 letter from “30 Days with Teresa of Avila” on Divine Intimacy Radio. When and how should we embrace suffering? Learn from St. Teresa through reflections on her letters in the book “30 Days with Teresa of Avila”: Day 30.